Vinyl floor tiles are hands down, the fastest and easiest way to spruce up a kitchen or bathroom, but in the event of remodeling, this means that you already have a floor, good or bad, in place. This begs the question: should you remove that floor? In many cases, you can install vinyl floor tiles on top of your existing floor, but it depends on what type of floor you already have and what shape it is in. If the present floor is something like sheet vinyl, take a deep breath and remove it. Since vinyl tiles don’t do a very good job of “smoothing over” imperfections in your flooring or underlayment, then the floor would need to be in very good shape. In general, it's more difficult to put vinyl over tile than the opposite; installing tile over vinyl. Any smooth, seamless or tightly sealed surface works well for vinyl floor tile: sheet vinyl, linoleum, etc. You can install vinyl floor tiles over ceramic tiles, provided that the grout lines are not too wide or deep. Wide grout lines will eventually show through, or to use industry lingo, "telegraph" through the vinyl. Wood flooring can also accept vinyl tiles, but it’s not the best. The optimum condition is to have a substrate of one-quarter inch plywood or another smooth underlayment, rather than flooring. With a chalk snap line and a measuring tape, measure the center points of all four walls. Snap a chalk line between facing walls, so that a cross is formed. Begin laying the tiles from the center point, and working outward within one of the quadrants. Fill the quadrant until you almost reach the wall. You’ll almost never have vinyl tiles that exactly reach the wall, leave this gap for now. Fill the remaining three quadrants, also leaving the tile/wall gap. Lay a full title across the gap. A portion should overlap the outer edge of your vinyl tiles. With a carpenter’s pencil, mark on the loose tile where the edge of the laid tiles falls. With a straight edge, draw a line between the two marks. Using the straight edge again, cut down the line with a utility knife. You may have to cut twice to slice all the way through. 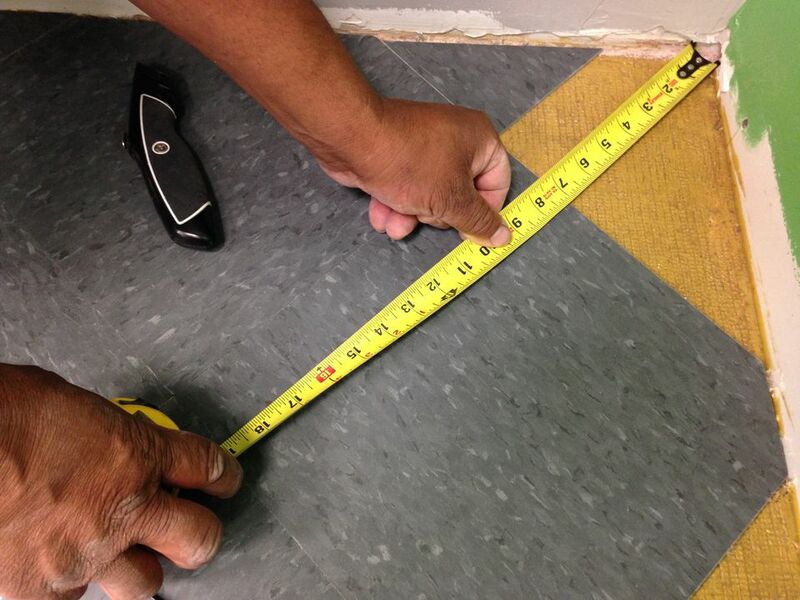 Don't cut on top of your new tile floor! Do this on top of a sheet of plywood or thick cardboard. Strip the paper backing from the tile and install it.